Last week, the International Monetary Fund (IMF) warned that the United States faces long-term fiscal challenges that policymakers must address. In the Concluding Statement of its 2015 Article IV Consultation with the United States, the IMF writes that “public finances in the U.S. remain on an unsustainable path." The IMF raises concerns that progress on important fiscal issues is being hampered by political dysfunction in Washington, which “creates a level of fiscal uncertainty that is damaging to the U.S. economy." To address medium-term fiscal imbalances, the statement highlights the need for specific reforms to the U.S. tax system, pension system, and healthcare system. Such reforms would bring significant economic benefits. "Tackling [these] longer-term fiscal challenges," the IMF writes, "would help support growth, job creation, and productivity." The IMF also released last week a staff paper, When Should Public Debt be Reduced? by Jonathan Ostry, Atish Ghosh and Raphael Espinoza, which is discussed further below. Every year, the IMF prepares assessments of the economic, fiscal, monetary, and financial conditions of its member countries under Article IV of its governing agreements. The assessments highlight the risks to each country and provide options for reducing those risks. On June 4, 2015, the IMF released its Concluding Statement of its 2015 Article IV Consultation with the United States of America1. The 2015 Statement warns that “public finances in the U.S. remain on an unsustainable path. The federal debt and deficit are expected to decline during the next few years but under the current constellation of policies this downward trajectory will not last. By 2019, the federal debt will begin rising again as aging-related spending pressures assert themselves and interest rates move to more normal levels." Tax reform. A reform of the U.S. tax code is long overdue. Complexity and loopholes have increased over the years, undermining revenues and damaging productivity. The IMF’s longstanding advice has been that changes should focus on simplifying the system by capping or eliminating personal income tax deductions; removing tax preferences exclusions and deductions from the business tax; and changing the tax treatment for multinationals to limit base erosion and profit shifting. In addition to improving the structure of the system, it is also worth reiterating previous recommendations that revenues should be raised through a broad-based carbon tax, a higher federal gas tax, and introducing a federal-level VAT. Pension reform. The prospective depletion of the Social Security Trust Fund needs to be countered through a gradual increase in the retirement age, greater progressivity of benefits, raising the maximum taxable earnings for Social Security contributions, and indexing benefits and contributions provisions to chained CPI. Healthcare. Cost pressures have declined but more efforts are needed. Legislation could usefully focus on ensuring a better coordination of services to patients with chronic conditions, steps to contain overuse of expensive procedures and technologies including through a higher degree of cost sharing with beneficiaries, and eliminating tax breaks for more generous employer-sponsored health plans." A major risk facing the United States, according to the IMF, is the dysfunction of our political system. The IMF notes that “the inability of the Congress and the Executive Branch to collectively pass a budget and corresponding appropriations bills creates a level of fiscal uncertainty that is damaging to the U.S. economy. The potential for disruption from either a government shutdown or a stand-off linked to the federal debt ceiling represent important (and avoidable) downside risks to growth and job creation which could move to the forefront, once again, later in 2015." If those political obstacles can be overcome, the IMF argues that policymakers would have resources to address many pressing problems: "tackling the longer-term fiscal challenges would provide scope to modestly expand the near-term budget envelope to finance supply-side measures that support future growth, job creation, and productivity. This would include front-loading infrastructure spending, raising labor force participation (e.g., through policies such as subsidized childcare assistance), incentivizing private innovation, strengthening education spending (including through apprenticeships and vocational training), and improving job search assistance programs. Creating a stable funding solution for the Highway Trust Fund that will prevent the need for continued stop-gap patches is an immediate priority." Understanding the IMF Staff Paper, When Should Public Debt be Reduced? In addition to the Article IV Consultation, the IMF also recently released a staff paper: When Should Public Debt be Reduced? by Jonathan Ostry, Atish Ghosh and Raphael Espinoza. The paper raises interesting questions about how countries should address public debt levels following the global financial crisis. Unfortunately, however, some may have misinterpreted how to apply the paper’s findings to the long-term fiscal challenges here in the United States. One of the paper’s primary positions is that countries should not generate budget surpluses to pay down their debt, but rather should gradually reduce the ratio of debt-to-GDP by allowing the economy to grow faster than debt. Some may interpret the paper as indicating, therefore, that U.S. policymakers have no reason to take action on our fiscal policies. This would be a gross misapplication of this research to America’s long-term debt, because we are not on a path to lower our debt as a share of the economy. To the contrary, the Congressional Budget Office projects that under current law federal debt will climb from 74 percent of GDP today to over 100 percent of GDP over the next 25 years — and to a staggering 183 percent of GDP under less optimistic assumptions. Rather than working from our current fiscal outlook of rising debt, the staff paper starts with the premise that our debt has already been stabilized, and explores whether it would desirable to reduce debt below current levels. Although this premise was necessary for the authors to explore the questions raised by their paper, our fiscal policy decisions must be based on our actual situation rather than a hypothetical scenario (particularly one that is so different from our current fiscal outlook). The paper argues against a country’s acting further when its debt is already stabilized at a safe level. The paper does not at all suggest that the United States does not need to take further action to stabilize its debt, or that it should allow federal debt to rise to risky levels. 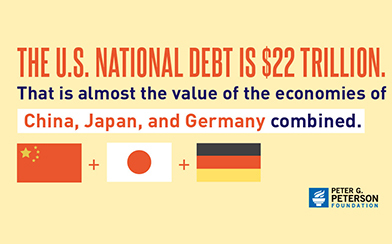 Our debt is on a dangerous and unsustainable path that puts our economic future at risk. The real challenge facing the United States — one that is outside the scope of the paper — is how to change the budget’s dangerous trajectory and put it on a long-term, sustainable path. Doing so will require significant fiscal reforms. The good news is that there are many options for putting U.S. fiscal policy on a sustainable course. As part of its recent Solutions Initiative, the Peter G. Peterson Foundation convened five think tanks from across the political spectrum to develop comprehensive fiscal plans. While the plans take different approaches, all of them successfully stabilize the debt over the decades to come. Taken together, these plans present a deep and broad selection of viable policy options for lawmakers to consider and pursue to build a more stable fiscal foundation for America. While the IMF staff paper covers interesting fiscal questions, one should not take its headline to mean that the U.S. national debt no longer requires action. The premise of the paper is that policymakers have already enacted reforms to stabilize our debt. While this has not yet happened, five think tanks from the Solutions Initiative have demonstrated a range of options for policymakers to get this done. Once we do this, the U.S. will face some worthwhile questions posed by this paper about what to do next. More importantly, with a strong fiscal foundation, we will be in a much better position to drive economic growth, prosperity and opportunity, now and in the future. 1For the full document, see: http://www.imf.org/external/np/ms/2015/060415.htm The statement was posted publicly to its website on June 4, 2015, and is dated May 28, 2015. 2It should be noted that the authors’ findings may also be driven in part by their assumption that only higher tax rates would be used to reduce debt. For example, the paper did not analyze the effects of using entitlement and/or tax reforms to lower federal debt. If properly designed, those reforms could reduce economic distortions and increase growth, which might have led the paper to a different conclusion.